One of the chief things that Christians are renowned for, both historically and universally, is singing songs and making music. This is in contrast to Islam, for example, where many regard music as haram (forbidden), and singing does not normally feature in Mosque practices. Now there are all sorts of reasons why Christianity is a singing faith; for the practice of making melody to the Lord, and of hymn singing in particular, has many purposes. My intention in this article is to focus specifically on congregational singing (rather than Christian music generally), and to open up its three principal purposes; the three main reasons why, according to Scripture, God has given us this ability and called us to engage in this activity. These reasons are: (1) to help us praise, (2) to help us pray, and (3) to help us proclaim. Over the next couple of weeks, we'll have a look at each of these points in more detail. The following is part of a conversation started over at Worship Matters regarding our physical expression in worship. Growing up, I was Michael Jordan's biggest fan. I regularly wrote him to ask for his autograph and invite him to my birthday parties. I was convinced I would one day be great like him, so finally after much pleading, my parents sent me to basketball camp when I was a pre-teen. I hated it. It was nothing but drills on proper free throw techniques. Coach would shout, "Bend your knees. Follow through. MILLER! BEND YOUR KNEES! FOLLOW THROUGH!" I was not a natural-born athlete, and it felt awkward. Eventually I realized that I would never be the next Air Jordan, but I did get to a point that shooting with the proper posture didn't feel so uncomfortably awkward---it felt natural. When a young man meets a young woman that he wants to impress, he stands up straight, shoulders back, gut sucked in. He maintains eye contact and a smile. When he wants to propose, he gets down on one knee. When he has messed up royally and needs to apologize, it's two knees. If someone points a gun at you, your hands rise in surrender. If your children want you to hold them or lavish affection on them, they raise their arms. At sporting events, when your team scores, you jump in the air, pump your fists, and shout as loudly as you can. When the ref makes a bad call, you throw your hands up in frustration and boo vigorously. Your heart is caught up in the experience of the moment, which causes your body to respond outwardly. We were created as holistic beings with intellects, emotions, and bodies all working in concert with one another to express ourselves. Depending on the study, we learn that anywhere from 70 percent to 95 percent of communication is non-verbal. We say a lot about what we think and feel without uttering a single word. Paul writes in 1 Timothy 2:8, "I desire then that in every place [people] should pray, lifting holy hands." He is referring back to many passages in the Old Testament where people were encouraged to pray and worship using specific postures---in this instance, the raising of hands. King David, the innovator of music in corporate worship, wrote hundreds of songs for the purpose of engaging the mind, heart, and body in worship. He understood that posture outwardly expresses an inward reality. Our body naturally acts the way our hearts feel. So we see encouragements throughout Scripture to bow humbly, raise hands joyfully, shout and sing loudly, clap hands, and even dance before the Lord. This must have felt awkward to the people of the day, who had never before seen anything like this. Similarly, we have been shaped by our experiences and may be tempted to forego these postures to avoid feeling awkward or uncomfortable, saying, "That's for other people. I was raised (whatever denomination), and we never did that." In doing so, we do not realize how our posture is shaped by our heart. Outward expressiveness in corporate worship is not the only indicator of our delight in the Lord, but it can be a telling one. 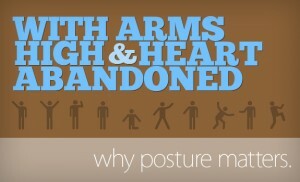 Still, worship posture does not mean the same thing in every context and congregation. In more traditional Western congregations, expressive worship of God may look like smiling as we loudly and fervently sing rich doctrinal truths and our hearts delight in him. In more contemporary contexts, we might raise our hands as we grow more fully consumed with adoration of God. We might bow before God as we become more fully immersed in a deep sense of humble, reverential awe. Yet no matter the context, as we experience the inward heart reality of worshiping God with all we are, our bodies reveal our heart's condition. That is why God wants more than for us to go through the outward motions without actually worshiping. The fruit of our outward expressiveness reveals the root of our hearts. Certainly there are moments when we should stand still in silence before the Lord---that in itself is a posture of worship. However, if we consistently find ourselves in corporate worship with our arms folded, mouthing the words with a blank, glazed over or bored look on our face, this posture indicates we may not be experiencing an inward heart of adoration, wonder, and awe that is characteristic of true, spiritual worship. But rather than forcing our hands in the air, we should ask God to draw us nearer to him and seek how he desires to be worshiped. We should plead with him to captivate our hearts and reveal any sin that might be keeping us from seeing and savoring him with all we are. God wants our hearts, not just our fake smiles, arms raised or our knees bent. He wants more than just our shouts or our songs. He wants more than just our theological intellects. He wants all of us.